I've noticed that using the default master page on SP2010, there doesn't seem to be any way to change the page title. 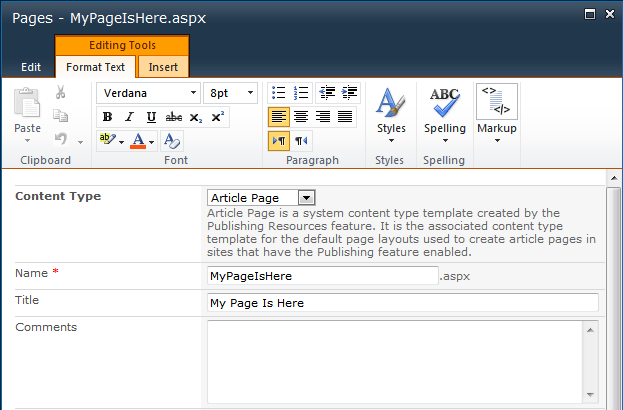 The page's Edit Properties is grayed out and in SPDesigner, the title area is inside this tag: <asp:Content ContentPlaceHolderId="PlaceHolderPageTitleInTitleArea" runat="server">. We have underscores in page filenames, such as my_page_is_here.aspx, but wish the top to show My Site > My Page Is Here. Any way to do this without modifying the master page? You can edit the file in SharePoint Designer. This would modify the html for this specific page and you would not need to edit the master page. There are other options depending on how this page was created. If you are creating 'Site Pages' by selecting New Page under the Site Actions menu, then the title property and the filename of the aspx page are the same value. You can include spaces so the display is how you want it, but the filename will have spaces replaced with %20 (my%20page%20is%20here.aspx). If you have the Publishing feature enabled, which is only available in the SharePoint 2010 Server editions, then this can be done through the UI. When creating the page, the title and filename are separate properties. Here are some screenshots for accessing the properties on the pages item. Not the answer you're looking for? Browse other questions tagged 2010 master-page page-layout or ask your own question.